In 2005, we took a long roadtrip from Calgary to Halifax NS, through the States, one way. We bought a disposable car, drove one way, and flew home. I’ll tell that adventure later. Since then, though, I have always had the Jolly Green Giant in my mind, and this was the trip that was going to fix that! 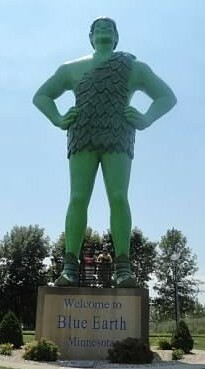 He is the symbol of the Green Giant Company (famous for canned peas and corn). The company started in 1926 as Blue Earth Canning Company, took the name Green Giant in 1950 and has since been bought out by General Mills. Jolls is 55’ tall (17 meters). I mean – that SEEMS tall, but what’s a good point of reference? 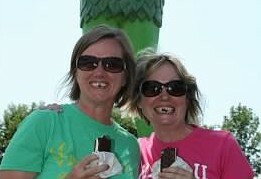 Well, look at this picture. We are standing by his 6′ long feet (size 78 shoe) and you can barely see us. His Giant smile is 48″ wide!! 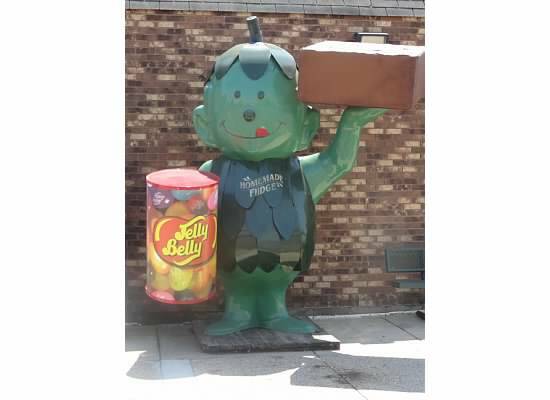 Mr. Giant’s little (10’ tall) pal, Little Sprout, has taken a job at a nearby local gas station and convenience store, advertizing Jelly Bellys and homemade fudge! After we left Blue Earth, we continued east. – well, we all knew, except Richard. Secret Spot to be revealed Sunday.